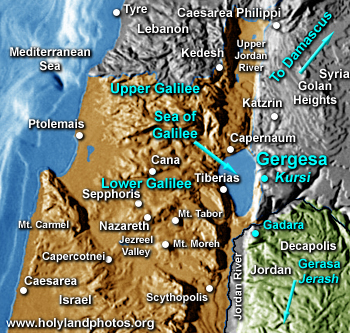 The site of Gergesa (modern Kursi) is located about [500 m.] east of the east shore of the Sea of Galilee. It had a harbor on the lake. An alternate reading in all the gospels is "Gergesa" and during the Byzantine Period the site of Kursi was identified with Gergesa and thus the healing of the demoniac(s). A large monastery complex has been excavated at Kursi. It was established in the middle of the fifth century A.D. and went out of use in the ninth century. Remains include a large church, a chapel on the slope of the hill, and some dwellings. For a thorough on-line article discussing the location of the event see Gordon Franz' The Demoniacs of Gadara who does not believe that the event took place at Kursi. Franz believes that the church at Kursi commemorates the Feeding of the 4,000.